Arrived in Venice on time and had excellent flights. The weather is great with lots of warm weather with sunny skies. The water taxi was great and took us directly to our hotel entrance window. There's a story there. More later as we begin our trip! 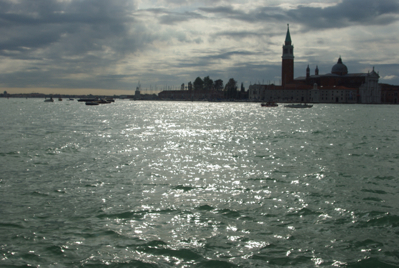 We awoke about 830 after a good night sleep, to sight see in Venice. After a beautiful full breakfast We went to find the closest Vaporetto (water bus) stop. We purchased 36hrs tickets and hopped the next one to the Lido island. 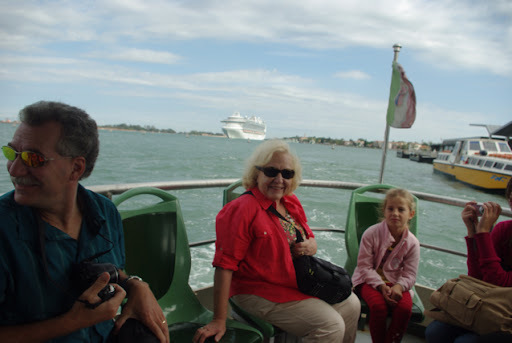 As we neared our arrival at the Lido the arriving Ruby princess began to enter the Venice waterways! 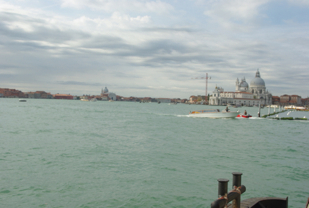 What a sight, we stayed on the Vaporetto and headed into the waterway to join her. we raced beside and behind her as she sailed up the grand canal. Great photos! The remainder of the day was full of shopping at Murano for glass and Burano for lace. All total we sailed around a majority of the islands and completed another 7 miles of walking. Nothing like the 10+ miles we walked yesterday! Tonight we revisited the Rosa Rosa Restaurant for a second evening, with the same outstanding results. Closing in on midnight here and the conclusion of our second day in Venice, hope all is going great for all of you too!